Your dorm room decorations for your dorm Christmas tree are the most important holiday dorm room decor items you will go dorm room shopping for. Your holiday dorm room decor starts with your dorm Christmas tree, but it is the dorm essentials you place on the branches that really complete your holiday dorm room decor style. Your dorm Christmas tree won't look as good in your college dorm room if it doesn't have some holiday dorm decorations on the branches. When you're adding dorm necessities to the branches of your college Christmas tree, start with our Sky Blue Garland with Mini Lights. 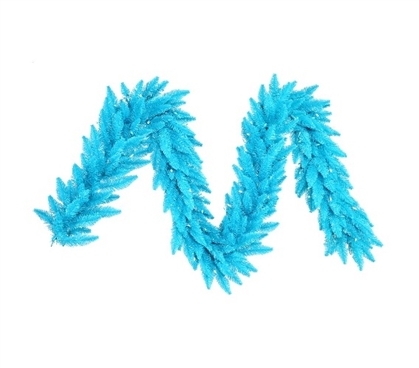 Our Sky Blue Garland with Mini Lights has such a pretty color you can't resist! The eye catching bright sky blue tips of this dorm item will make your holiday dorm room decorating stand out from everyone else's for the holiday season. Of course you know that your Christmas lights are just as important as your garland for the holiday season. This dorm item has two dorm essentials you need for your holiday dorm room decorating in one cool dorm item! Our Sky Blue Garland also has sky blue mini lights on sky blue wire wrapped through this dorm necessities item to provide extra impact in your college room decor. You can even wrap this dorm item around your college dorm room desk or make a design on your dorm wall for dorm wall art!